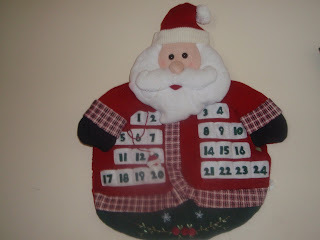 Photo (to illustrate the last tip provided in the article): Our Christmas Countdown Calendar provides a fairly low key way to track the holidays. It's up a few feet above our living room entrance way. Usually our five year old who is not on the spectrum is the one who reminds mom to move the little Santa from pocket to pocket. The ten year with ASD likes it when we remember, but doesn't seem to notice when we forget to change it. Meltdown week here at this blog was inspired by the holidays. I think it's a time that can inspire anyone, on the spectrum or not, to have a meltdown. Throw in flu and cold season and bad weather (for those of us in harsher winter climates) with the factors mentioned in the article and things can get extremely stressful to say the least. The following is an article appearing in the most recent issue of Kid's World News. It's a publication featuring news from local schools. The mini newspaper, written for kids, comes home in both my boys' back packs. The following article was one adapted from one on KeepKidsHealthy.com, Nov/Dec 2005 and Texas Children's Hospital. "The holiday season is upon us, and for many families that may mean decorating the house, baking cookies and endless shopping trips. Mixed in with the constant holiday music, you may hear the faint strains of children (and adults) suffering from the stress of the season. We all want our holidays to be unforgettable, filled with happiness, traditions and memories. But the truth is that holidays are filled with hustle, bustle and new routines, which can be a never-ending whirlwind of stress for children. Limit TV and video game time and increase physical activity and exercise time. Remember your child's normal routines, and try not to interrupt them. Stress is often the result of routine changes over which your child has no control. Family traditions are very important to you and your children. They offer great comfort and security for children when other routines are disrupted. Maybe your family tradition is putting up the tree, decorating cookies, or reading a special book. Be sure to make this family tradition all that it can be for your child. Do occasional attitude checks, before the holidays get into full swing. Take a deep breath, and have everyone in the family agree to do their best to make the holiday season a time of joy and family peace. If you are doing a "countdown" activity with our child, be sure it is low key and doesn't add so much anticipation that our child is stress or anxious." Laugh a lot and breathe! Sound advice! I find keeping routines are vital.